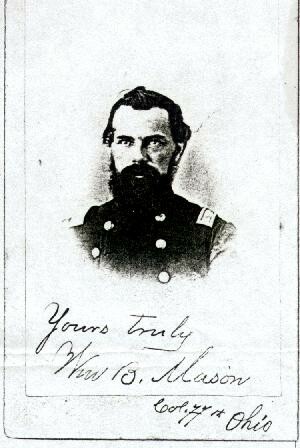 Colonel William B. Mason, Jr. , grandson of William Bond and Suusanna (Coburn) Mason, was Washington County Recorder from 1855 to 1861, when he left for the war, entering the war as a private and coming out in 1865 as Colonel of the 77th Regiment. In 1866 he was elected Washington County Treasurer, holding the office during one term. From 1870 to 1878, he was Postmaster at Marietta. In 1880 he engaged in the hat business in Marietta. He was devoted to Masonry and was initiated, passed and raised as a Mason in Mount Moriah Lodge No. 37 of Beverly, Ohio being intianted August 28, 1847. Past and raised Sept. 5th of the same year. He was elected and served as a Senior Deacon in 1849-49. Elected and served as Senior Warden in 1851. Worshipful Master in 1853. He joined American Union Lodge No. 1., F. and A. M. by demit July 1, 1859. On the 15th day of August. 1863, Grand Master George Rox issued a dispensation to Lodge "Shiloh" 77th Regiment Ohio Volunteer Infantry, with Br. Wm. 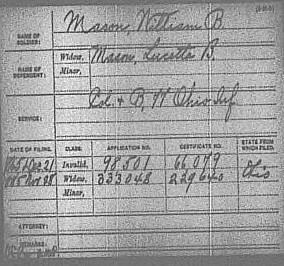 B. Mason as Worshipful Master which position he filled creditably until mustered out of the service Dec. 31, 1864. Contributed by Debbie Noland Nitsche.